La Vall d'en Bas is a large municipality in the south of La Garrotxa consisting of a broad agricultural plain (the Bas valley) with the mountains of La Serralada Transversal providing a stunning backdrop. 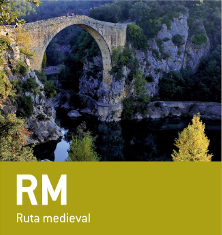 Scattered throughout the plain (one of the most fertile agricultural areas in Catalonia) there are seven singular villages, two of which have been catalogued as of historical-artistic interest. The first is the hilltop village of El Mallol, which was once the administrative centre of the Bas Vice-county, the other being Hostalets d'en Bas, which owes its origin and name to the inns (hostals) that were situated here at the foot of an important stretch of the King’s Road running from Olot to Vic. Today, this village and its surrounding area are one of the most familiar images of the county of La Garrotxa. Sant Esteve d'en Bas is currently the valley’s main town and it is worth visiting the church to admire its columns and capitols depicting historical scenes. The village of Joanetes lies in the shadow of the cliffs of Puigsacalm and is a perfect setting for the very popular living nativity scene that is held there every Christmas. Its most notable building is the church of Sant Romà, documented from the twelfth century. Puigpardines lies at the foot of thick oak- and beech-clad slopes and is probably the smallest and most peaceful of all the villages in the valley. One of its most important buildings is the church of Santa Maria de Puigpardines, once part of a monastery, the only visible vestige of which is a medieval doorway. La Pinya, the most northerly village in the valley, boasts a parish church – Santa Maria – dating from the tenth century. Beside the church stands a public washhouse, the only one of its kind in the valley and one of the few still surviving in La Garrotxa. Last but not least, the attractive hamlet of Sant Privat d'en Bas consists of a small settlement of houses and a church clustered around a square reached via an arched entrance.